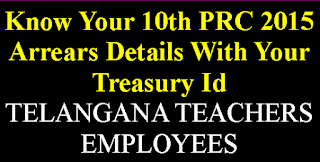 Telangana Employees and Teachers Can Check and Download Their TS Telangana 10th PRC 2015 Arrears Details Month wise. As You Know TS 10th PRC 2015 Arrears are Divided in 18 Equal Months and TS Govt Paying Months wise PRC Arrears. 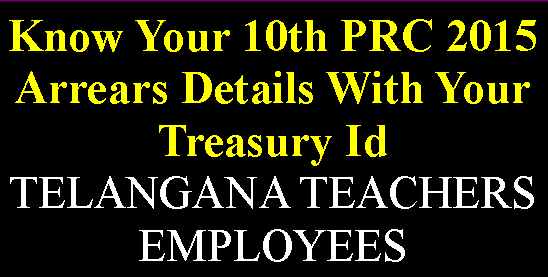 TS Telangana Teachers and Employees Can Download Their TS 10th PRC 2015 Arrears Month wise Details From TS Official Treasury Website. or You Can Download Your TS 10th PRC 2015 Arrears Month wise Details From Below Steps. 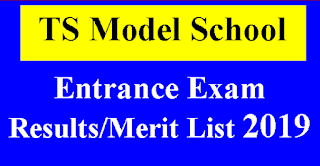 Click On Link TS PRC 2015 Arrears and Enter Your Treasury ID You Will GET Month Wise Details.